Creating Passionate Users: What if managers had to do tech support? What if managers had to do tech support? Years ago, Bert Bates worked at a software company where 95% of the 100+ employees had to spend time doing everything. Tech support. Customer training. Visiting clients and helping with installation and customization. Think about that. Marketing had to spend two weeks in tech support. Engineers had to spend two weeks doing customer training. Managers had to spend two weeks doing testing. Executives had to spend two weeks doing customer service. Documentation writers had to spend two weeks teaching classes using only the manuals they'd created. Accounting had to go on a 10-cities-in-14-days business trip and fill out their expense reports accurately, on time, and without a single missing receipt. Sales people had to spend two weeks in a programming course. Existing customers had to approve your marketing and advertising. Clients attended your staff meetings. 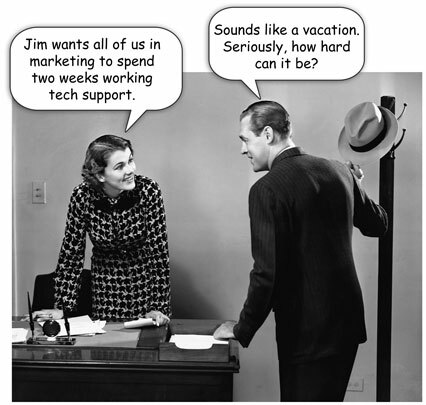 What if tech support and customer service reps were treated like the top sales people? What if they were sent on all-expense-paid trips based on how many customer complaints they fixed? It's common in many industries (hospitality especially) to put everyone through cross-training that includes direct customer contact. In software development, it's rare. And according to Bert, the difference it made to that company was profound. I've told the story before that I once attended an all-hands department meeting at Sun and asked the group of 100 to raise their hands if they'd spoken with a real customer in the last 12 months. The number of hands not raised was shocking, especially since a customer training facility was in the same building, and dozens of customers were on-site virtually every day. I don't blame the employees... I blame the upper management of that department for having a culture that saw customers as line items on a defects-per-million Six Sigma chart. For having a culture that made it easy to not think of customers as actual humans with names and needs. Can you think of any other "what if..." things that might apply to the tech industry? I worked for an internet company where the management required everyone - front desk, accountants, facilities and even management - to know at least some basic HTML. Then we were bought by a larger company and that rule was lost. Some of these are really funny but I have to tell you the accountants would do just fine. They would have excel on their spartphones and have a organizer for their receipts. That type of thing is exactly what they thrive on. When I ask my sister the controller for advice I usually get some sort of spreadsheet back from her. Right now my day job (not my personal company) is looking to expand to the east coast. It was all rumor and speculation until today when we all get a memo explaining first a promotion then second in a "oh by the way" type of add-on "we're looking to expand to Virginia". What would management think of this type of communication if they spent 2 weeks in IT or in another department? I wonder. I wrote about some ideas of transparency and making employees the owners of change here just today because the memo fired me up a bit. The ideas listed here would so change my company right now...in so many ways. As an I.T. Manager that manages and works in a lean I.T. shop at a major Japanese manufacturing company, management is only 50% of my duties. The rest of the time I provide direct technical support to users and management, assist in user training activities, as well as programming/debugging of core business systems. It takes careful balance and well-defined priorities, but it also gives me additional clout when speaking of technical matters with other managers. The Japanese associates of this company have related that they regularly only work in one area for approximately four years, and then are transferred to a new area. They may be transferred from I.T. to Accounting or Engineering and then to H.R. for example. It’s strange to them that we Americans stay in the same field for most of our careers. 20 years ago, I was the application development manager for a state agency. Realizing how much of a vacuum most of my staff existed in, I did two things to expose them to more than their programming assignments. I assigned them help desk duty, two people each week, from different projects, on a rotating schedule. There was a book of calls and resolutions, and until it was completed for all calls received that week, that team couldn't hand over the help desk duty to the next team. It forced them to learn about other IT things going on around them. The other thing I did was to send them off to spend time not just interviewing users, but documenting what they did and following them through their processes. They particularly spent time in the records department, so that they understood that data in the computer had real equivalents in the world outside the computer. They often complained, but that was the best staff I ever worked with. What if... project managers had to be graduates again. Could they remain passionate and motivated when on their very first day of their very first job are told "Our clients are really difficult, be thankful you dont have to talk to them"...and "Java is just a fad it'll never last". Totally not what you want to say to a new employee let alone a graduate with motivation and passion! Little off the beaten track but this reminds me of a thing called "balanced job complexes" (http://en.wikipedia.org/wiki/Balanced_job_complex) which were defined as part of a economic system called Participatory economics (http://en.wikipedia.org/wiki/Participatory_economics). The basic idea being that if every one rotates around all of the tasks in an organisation, no one will have a monopoly of information that exists with a traditional division of labour. Its all very interesting but I remember thinking that it was also a useful idea of running an organisation as well. Better quality decisions made since more diverse views can be included in the debate. Quicker to take decisions. That kind of thing. I'm firmly of the opinion that development teams should spend 6 months supporting each major app they create - and train their successors in live support. The ability of the support team who take over from them to support the app should be a factor in their performance reviews. Otherwise you risk the situation where people create unsupportable apps and ride off cackling on to the next project while it takes a year discovering how broken their last efforts were, and discovering them by major failures in the live app rather than by proactive bug-hunting by a clued support team. At my firm, every IT manager gets the opportunity to take tech support calls for a few hours during Customer Service Week (first week in October). We've even had our COO and CEO take calls, and it's expanded to our Marketing and Communications Director, other Operations managers, and anyone else who's interested in learning how we work. Our CTO loves it, as it keeps him plugged into what my team does as a Help Desk manager, and competes to see how many more calls he can take than the other managers. Rather than MAKE managers do this, I ALLOW them the opportunity to do so, and this gets a much better reception than the mandatory time on the Desk would. It's all in the attitude of your managers, and of the people on your Help Desk. Joel on Software had a great piece on this some times back: The Fog Creek MBA ! Emile: thanks for the story link! Personally, I've never worked at a tech company that thought this way, although I did work one non-tech job where everyone spent time working reception greeting customers. Phil: "Rather than MAKE managers do this, I ALLOW them the opportunity to do so..." that's a great perspective. "It's all in the attitude of your managers, and of the people on your Help Desk." Yep. The question is, how do we get more managers to feel this way? This is a good idea, it would take some creativity to rotate people through software development. A two week training course is an interesting idea, but it could actually do more damage than good. I bet someone from sales (without a technical background) could learn to create a simple database-driven PHP site in a couple of weeks - and leave with the impression that this is all pretty easy. It's in the following 50 weeks of the year, as you struggle with the maintenance consequences of pushing a rushed job into production, that you really learn about software development. Columbine merged with JDS to become Columbine JDS. They moved out of Golden to downtown Denver. Columbine JDS was gobbled up by Encoda Systems. Encoda Systems was gobbled up by Harris Corporation. I don't know much about Harris, their corporate culture, or their industry. A friend of mine (from the days when Bert & I worked together at Antalys) works at Harris, though he and I don't talk about work much. In my view, development teams would be more productive if it consists of members who have done support of applications at least for 6-8 months. They would in a position to understand the big picture of the application that they develop and would take sufficient precautions to prevent issues spilling in live/production environment. Managers who have done tech support would definetly add value to improve the efficiency of the service that each organisation provides to its customers. It would be a challenge for the organisations to adopt Phil's perspective "Rather than MAKE managers do this, I ALLOW them the opportunity to do so..." and organisations who practice this will have better edge over others. Such practice would not only boost the morale of tech support teams, but it would also indirectly increase the value of the organisation. My sister works at Disney and on Easter weekend and several other very busy weekends, everyone including managers work "on stage" in the parks. She strongly feels this helps her understand the customer as well as staff who work "on stage" in the parks. As a person who works in advertising designing travel ads, she feels strongly that it has positively impacted her creativity. As organizations compress and become "flatter" this grassroots type of connection with the customer is going to become more important. When upper level managers become insulated they become nonresponsive. I remember in my cellular days discussing an experience mystery shopping in a market. At each location I was presented with an unadvertised $5 per month cellular plan that was on no material. As I proposed a plan to respond to this very real threat, the president said "We are not going to price against that plan because it does not exist." I said, "Excuse me, but here it is in writing." He then said, "It does not exist because I say it does not exist." It was truly an eye opening moment about how some upper level managers determine to insulate themselves from the reality of the marketplace. Needless to say, it was a very brief time before a merger ousted him from the company. The market is the market whether or not managers choose to understand them or not. "How do we get more managers to feel that it's an opportunity than something demeaning?" Great question Kathy! First, by allowing my team to have FUN at their job. Currently I have people on my team who sit on exercise balls instead of regular desk chairs, because they want to get in shape? Does it help them get in shape? WHO CARES! It helps them feel better, and that's what it's all about. I then show how much FUN it is to be on the tech support desk. I actively market my team to the rest of the firm, by making call backs, taking pictures of my team in action, hosting FISH! activities that I invite the rest of the firm to, writing articles for our internal newsletter, and the like. I don't shy away from volunteering for other committees outside of tech support, and I encourage my team to do the same. People get to KNOW my team, by the pictures they see, by the smiles they feel when they reach my team, knowing that the LOVE is coming their way. And then the people who called tell their managers, who tell their managers, who eventually tell the CEO that he has to check out what's happening on the Help Desk. That's how I do it anyway. If anyone wants help with this, stop by my site and contact me ANYTIME. I'd love to assist if I can! I am surprised and not so surprised by how many people actually "work" for a living. As usual, great post, Kathy. More power to the generalists! Your question it absolutely on target. It's not just marketing - but product development - management - training. The benefit when these "others" have the guts to get on the phones is three fold. First, it gives them a completely different perspective that will aid them in conducting their jobs and viewing their co-workers. Second, it connects them directly to the ones they are supposed to be working to satisfy. Finally, it gives them credibility with the front-lines and makes for better teamwork. Thanks for the post. This article from Digital Web Magazine seems like it would be a nice addition to this conversation. Your comment about "having a culture that made it easy to not think of customers as actual humans with names and needs" reminds me of an initiative currently going on at IBM/Lotus. They're using "the Design Personae Technique" for developing the next version of Lotus Notes (codenamed Hannover). The hope is that as the developer puts a face to customer, they also begin to really respect the needs of that customer, and the design should reflect that. Sadly, the company I'm at now just doesn't "get it". They think if the users don't "love" the Helpdesk it MUST be because we aren't doing a good enough job with the machines and software, or that our staff has an attitude problem. Many people will not raise their hands no matter what you ask. You can bias a quick show-of-hands survey by inverting it. If you want the asnwer to come out A, ask everyone who's not-A to raise their hands. If you want the answer to come out not-A, ask everyone who's A to raise their hands. if you really want the answer you have to ask both questions: A and not-A. There were probably a lot more people in your audience who'd had direct customer contact than you counted. Ricardo Semler, in his book "The Seven Day Weekend: Changing the Way Work Works" mentions another reason this is important. What if a member of your customer service team is very technically inclined? Or the manager in charge of receiving also happens to be very proficient in accounting principles or high-end solution selling? How would you ever find out their true competencies or what really interests them if they never get a chance to see and experience the other tasks within a company? This is one of the primary reasons Semler discusses allowing his employees (and encouraging them), at Semco, to switch job responsibilities, divisions, etc. when they like. This leads to greater job satisfaction, company knowledge and profit in the end. Way back in the early '80s we had implemented a new mini-computer-based system for vehicle maintenance. The managers kept wanting to keep the old paper records because they didn't trust the new computer system. The service writers (they did most of the data entry) kept asking why all the duplication of effort, but the managers didn't listen. At the end of each month we had to hire temps to finish entering all the data and we couldn't close the month until the middle of the following month. After a few months of this we (new management, including those of us implementing the new computer system) decided that if the data entry wasn't finished on time that the managers had to stay (they were salaried) and finish the input themselves. There was plenty of warning, and the next month, there were the managers doing data entry and running all the reports. Amazingly, their first question was, "Why are we doing all this duplication of effort?" They not only learned how to use the new system, but they saw firsthand what the service writers had been trying to tell them all along, "forget the old manual system and filing of forms and filling out old logs, etc." That was the last month we needed temporary workers, the overtime costs went down, the old paperwork was discarded after the data was entered, and the data was now nearly real time. We could actually pull records on vehicles and have current, up-to-date data available that a batch system (mainframe) could never match. The point being that the managers had to step into the workers' shoes; service writers, parts people, accounting assistants paying bills, etc. When they did, it became clear what was good about the new system and they were more willing to listen to their employees in the future.